The world is the wheel of god, turning round and round with all living creatures upon its rim. The world is the river of god, flowing from him and flowing back to him. dharma, a word and concept found in all spiritual traditions of the east, has many, many interpretations. regardless of nuance and interpretation in the various takes on dharma, one notion underlies all - and that is that dharma signifies the interconnectedness of all life and nature. the word literally means to bear, support, sustain. the symbol of the dharma is the wheel. the picture above was taken when a few tibetan monks from the namgyal monastery in ithaca visited cleveland. 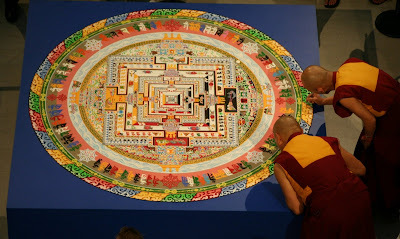 for several weeks the monk artists created this kalachakra mandala. the kalachakra mandala is one of the most intricate mandalas and contains many wheels. the kalachakra mandala may be considered a manifested prayer or meditation for peace and physical balance for individuals and for the world. it is thought that a person who simply sees this mandala may feel peace on many levels. to see a slide show of the construction of this mandala click here. d is also for dixie the dog! thanks Mouse for this. It is just what I needed to hear at this moment. I am always amazed at the timing of the universe. 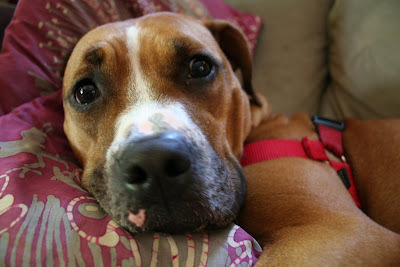 I just wanna go up to Dixie and hold/hug her and let her plant a good wet sloppy puppy kiss on my cheek! That mandala and its construction are nothing short of amazing. The patience, the steadiness and the insights are profound. Please give Dixie the dog a big cuddle from me! gotta find myself one of those mandala coloring books! good to have on hand for myself and the various kiddos that hang here. av - cuddles will be given in your honor!